Remember packing up that wood paneled station wagon and taking a long road trip cross country with your family? Well that is what we do here only we record it and share it with you. We hope you create many happy family memories on your own road trips. We are back from our road trip to the Universal Orlando Resort and The filming of The Tonight Show! We took a nine hour road trip to The Tonight Show so Jimmy Fallon and crew could experience a road trip of their own in the Wagon Queen Family Truckster. Be sure to read our Tonight Show blog post and also watch The Tonight Show Orlando Vacation Cold Open. We love to find cool events, tourist attractions, and hotels and festivals that you can road trip too with your friends or family. If you are looking for the coolest 5k run EVER, this is it. We ran (walked) the Zombie Run in Perry GA. It’s the most amazing place to have a 5K that I have ever seen. Check it out. We drove TEN days across America to the spots in the National Lampoons Vacation Movie in our Wagon Queen Family Truckster. Our final stop on our road trip was at “Walley World” to ride the Colossus wooden roller coaster one last time. Then it catches on fire just two weeks later after it closes. Here are the final moments on our Griswold family Road Trip. We head from Pop’s Soda Stand on Route 66 on our last episode to Amarillo Texas to express our creative side at the Cadillac Ranch. Yes you get to spray paint Cadillacs. We also met up with our friends from ICN and CCTV to help with their Explore America Route 66 Television series. We want to find and discover those unique roadside attractions and this episode of Griswold Family Vacations I hope does not disappoint. We packed up the Truckster in Atlanta GA only to have to unpack everything and take the Yukon as we headed up to Chicago IL during one of the worst winters in history. I of course slipped on ice at our overnight hotel stop and smashed my face up really good, but after two days of travel we made it. I don’t want to give away this episodes unique attraction, but will say it’s 20 feet below street level hidden under a funeral parlor. It is a family friendly attraction, yet odd, and our kids and us loved every minute we spent there. Sydney, Australia – Cute Kangaroos & Sleepy Koalas, What More Do You Need? You can’t go all the way to Australia and not see the amazing variety of animals. The kids wanted to see Koalas and finding Koalas in the bush is not easy, but just 45 minutes outside of Sydney is the Featherdale Wildlife Park. I even got to feed Kangaroos for just a buck and pet a Koala, now that’s cool. Our first travel tip is don’t go hungry and this hidden gem is a little known off the beaten path pop-up donut shop. It is called Doughboys and they are located in Victoria Market. They are a “pop-up” so they can move from time to time and only there dedicated fans, and you, will know where to find them when you are in Melbourne at 456 Queen Street but always follow them on Facebook: https://www.facebook.com/doughboysdoughnutsmelbourne so you know where they are at. We have logged many miles road tripping across this great nation of ours and also have packed up the family and have traveled overseas and on many cruise vacations. 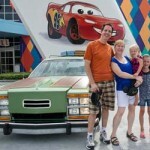 Come along with us as we pack up the Griswold Family Truckster and road trip to our favorite Disney Destinations in this very special Griswold Family Vacations – Disney Edition!